It is that time of the month again! No, not that time of the month, but the time when a new month is approaching and all beauty bloggers and vloggers freak because they have to remember their favourite products from the month that is ending. Luckily I have been good this month and kept a list of all the products I wanted to mention! *stop typing to tap my shoulder* I might do a "second half" of this post where I go off on about other beauty products I have been loving such as skincare and haircare if that is something you'd all like? Anyway, let's dive into this jumble of loveliness! First off: Lip products! For once I have been wearing something on my lips more or less everyday for a long period of time (I used to always get bored of reapplying and carrying around a lipstick...) and wait for it; I have been wearing a lipgloss! Some of you may know that I am not a huge lipgloss fan but this month I have been loving the combo of MAC's Patisserie with Over Indulgence over the top. This neutral, earthy-pink combo (earthy-pink, really? oh well I am awful at describing colours) makes a perfect everyday, sophisticated lip colour and the best part is that it lasts for quite a few hours before it needs any topping up! My other lip favourite has been Watch Me Simmer also by MAC! Super bright, coral/pink-y in colour and perfect for spring and summer! Wearing this makes me happy, and although it is a product that requires precise application it is super long lasting (it is an amplified lipstick) and very pigmented so once again, no need for frequent re-applications. That makes me a happy bunny. Over to eyes! Only two products made it in this month and those were Clinique's very famous High Impact Curling Mascara and MAC's Soba Eyeshadow! Both are super products, obviously they woulden't be mentioned here if the weren't, and I have been using them both more or less everyday. The mascara is maybe not the best at curling but a coat of it over my Telescopic Waterproof mascara and my lashes look superb with volume, thickness, length and definition! The eyeshadow has been mentioned here on the blog before and there's nothing to say but that this is the best eyeshadow for a quick, all over the lid, wash of colour. Face, face, face, face. I have been loving my recent foundation routine and it is down to mainly two products. Laura Mercier Tinted Moisturizer and Too Faced Chocolate Soleil Bronzing Powder will give anyone who asks for it a glowy, soft, airbrushed-looking skin. The tinted moisturizer has the consistency of something super silky smooth and the powder has warm, but not orange undertones which can give even me the illusion of a tanned face. Believe me, that's not all that easy. Last but not least, the Revlon Pinched Cream Blush is natural yet fresh and glow-giving with its hint of shimmer and peach tones. I loves it very much. 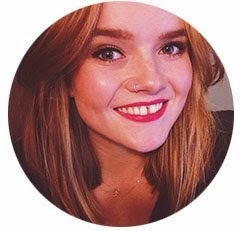 That was all of my favourite beauty products for the month of April, but I would love to hear about yours so please leave them in the comments or link me to you blogpost/video if you have one of them :) I would love to check it out and discover a few new products! The Too Faced Chocolate Soleil is my favourite bronzer ever. MAC Watch Me Shimmer looks lovely will need to swatch this next time I'm in mac. 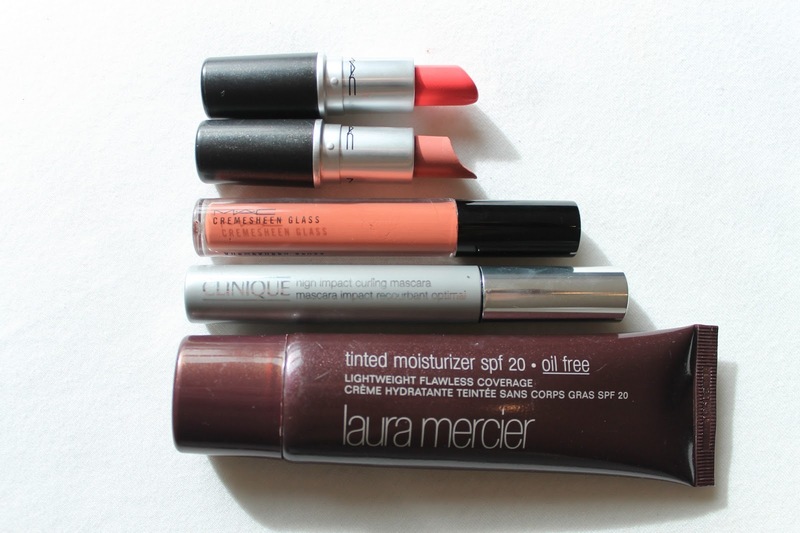 I rrrrealllly want to try the Laura Mercier tinted moisturiser but we don't have a counter where I live *sigh*. I love the look of Watch Me Shimmer too! I have to say that those lipsticks from MAC are really calling to me - I LOVE the colours too! 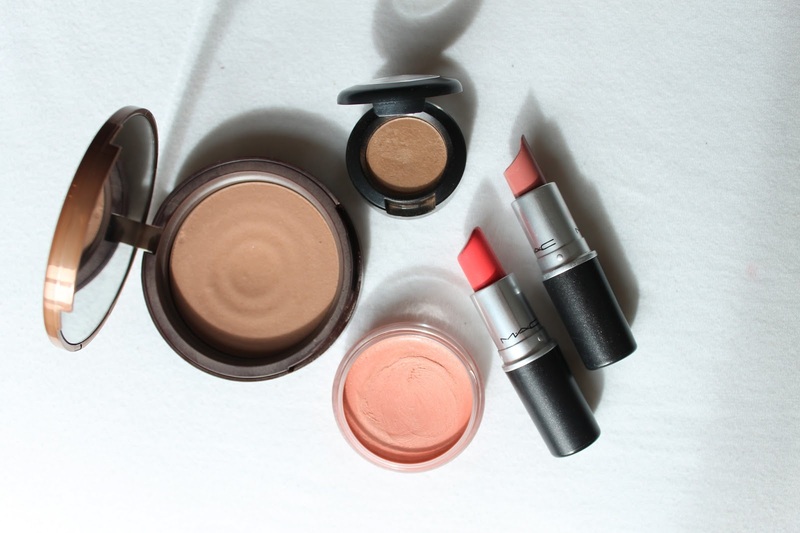 I'm a big fan of cream blushes. I adore the Illamasqua and Stila ones, and now I need to try this Revlon one! Looks so good! 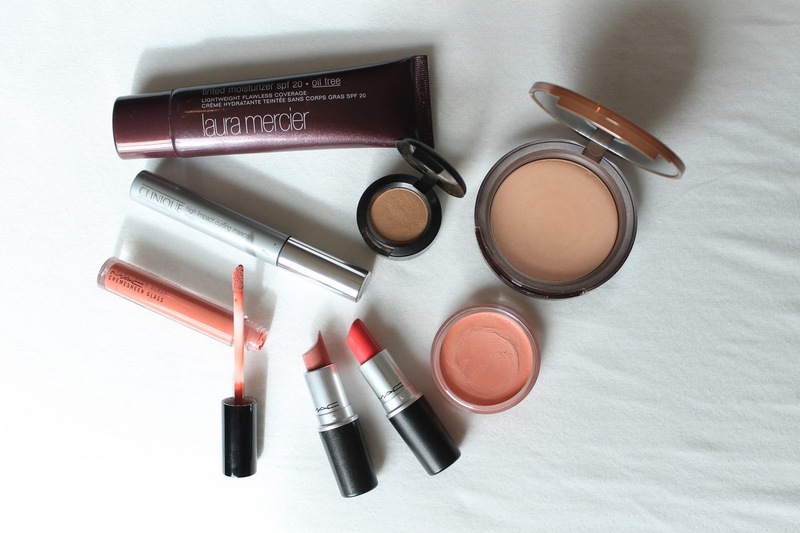 Great picks, I love the Laura Mercier moisturiser! !